In short, it is now easier for OTAs to hijack even more of your brand name traffic for less money. 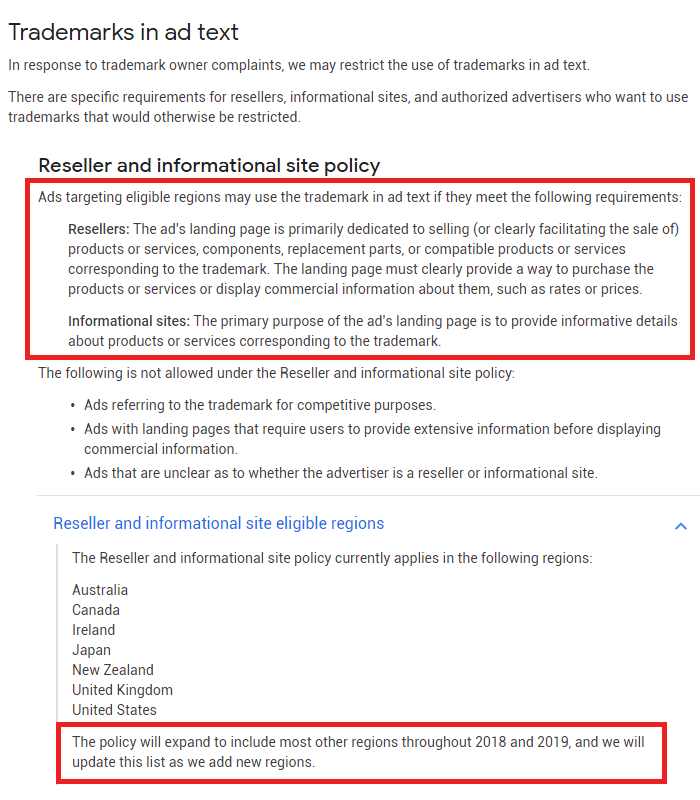 Resellers: The ad’s landing page is primarily dedicated to selling (or clearly facilitating the sale of) products or services, components, replacement parts, or compatible products or services corresponding to the trademark. The landing page must clearly provide a way to purchase the products or services or display commercial information about them, such as rates or prices. Informational sites: The primary purpose of the ad’s landing page is to provide informative details about products or services corresponding to the trademark. Source: Google Advertising Policies: Trademarks page. Hoteliers should be very worried. If you thought that OTAs have covered every organic search result pages with their ads, they will now be able to target branded searches even easier. 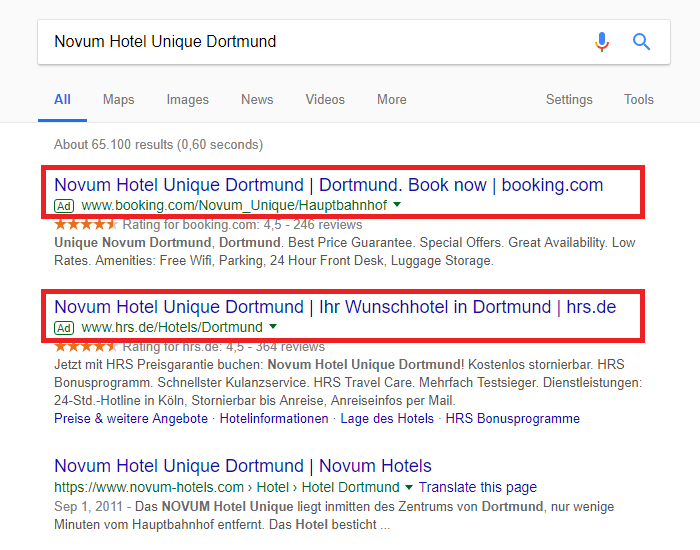 Consider the search for “Novum Hotel Unique Dortmund” (results screenshot below). Results like this will become a normality. Even when a visitor knows exactly which hotel they want to go to, they will still be bombarded by OTAs with “deals” and best price guarantees. But wait… this is nothing new! Google has stopped restricting the usage of trademarks in targeted keywords many years ago, but they were able to restrict the appearance of your trademarks in the ad’s text, even if submitting an infringement claim was required. What’s new however is that OTAs will now be able to use your exact brand name in their ad headline and description, thus increasing their ad’s “Quality Score”. In short, this means that OTAs will now pay less for targeting your brand name searches. This also means that the average cost per click (CPC) in your own branded campaigns will rise (probably significantly). And even if you keep the same amount of traffic at an increased cost, it is very likely that you will lose direct bookings either way. Realistically – not much. Google will continue finding ways to chip away at your bottom line. The only solid way of fighting monsters partners like Google and Booking.com is to invest more time and effort in your own storefront – your website. The more you ignore the issue, the more difficult it will become to catch up in the future. Secure your business’s future with a better website for your hotel or bed and breakfast. I became aware of this issue after reading an article by Simone Puorto for Tnooz.com, where this policy update is explained. Thank you Simone for shining a light on this from a hotelier’s perspective.